One of the things that most defines a hero in a Star Wars film is having faith. Faith in the Force, faith in fate itself, but most of all faith in other people, that they will do the right thing when it matters most. Luke has faith that Anakin Skywalker will not let the Emperor kill his only son. Obi-Wan has faith that Luke will become the Jedi his father never was. Leia has faith that her brother will be found and come back to help save the galaxy. However, increasingly, we’re seeing deconstructions of that sort of faith. The sequel era especially seems to relish twisting that idea around. Rey is the poster child for this, everyone she has faith in turns away from her (Finn in The Force Awakens, Luke in The Last Jedi), dies (Han), or exploits that faith somehow (Kylo Ren). Her character arc is as much about having faith in herself as anything else. 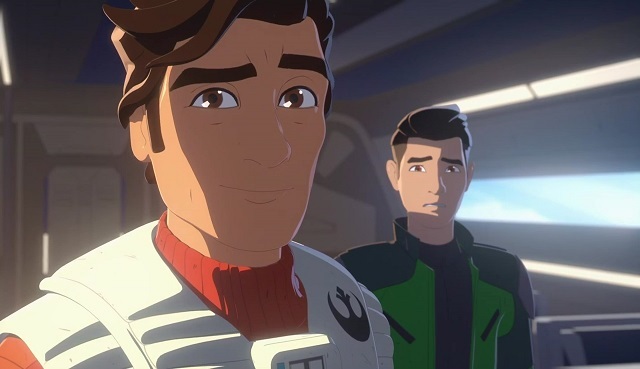 But all of our heroes from this era seem to run into this sort of problem, and Star Wars Resistance has brought another one of these to the forefront beyond the scope of the films: Poe Dameron. While Poe having faith in his friends and comrades is a fundamental reason why Finn leaves the First Order and joins the Resistance, there is a subtext to Poe’s arc in TLJ that sometimes he can lean too much on this faith and not enough on facts or logic. It’s Poe’s faith in his comrades to do the impossible that lead to the loss of Cobalt Squadron, and his faith in Finn and Rose’s plan that almost destroys the Resistance entirely. And, rewinding the timeline a bit but moving forward in out-of-universe time, we come now to his faith in Kazuda Xiono. A common criticism of Resistance as a show is that Kaz is just not an ideal fit for a spy. He’s clumsy, he’s loud, he makes a lot of mistakes and gets into a lot of accidents, he’s completely unprepared and untrained to do anything but fly. So that raises a very logical question from the audience: why would Poe entrust a valuable fact-finding mission to such a person? But what if that’s the point rather than a nitpick? Poe mentions that he sees something in Kaz, that he can grow to be something special. But this faith in Kaz’s potential may have blinded him to a reality that Kaz simply is not what Poe wants him to be, at least not yet. Worse, no one on the Colossus is interested in helping him learn since no one but Yeager even knows why he’s there. Everyone on the Colossus that he interacts with is rightly suspicious of the First Order, but they have no idea (yet) that Kaz is supposed to be spying on them for the Resistance. To them, he’s just some dumb schmuck that seems to constantly mess things up. Did Poe overreach and give Kaz a mission that he could not handle? Yes, actually. On his own, Kaz has done almost nothing right in his mission and has had to be bailed out of scrapes constantly, sometimes by people he’s only just met. The information that Kaz has gathered to this point—that the First Order is actively trying to take a controlling interest in the Colossus and of their attempted genocide of the people on Tehar—he lucked into more than finding out through any great espionage. It’s understandable for Poe to take a liking to Kaz. He probably sees a lot of himself in the young man, a natural flyer most at home in the cockpit, youthful and enthusiastic. But trusting this sort of mission to him, a mission entirely outside of his skill set that he is both untrained and unprepared for, is an extremely tall task. 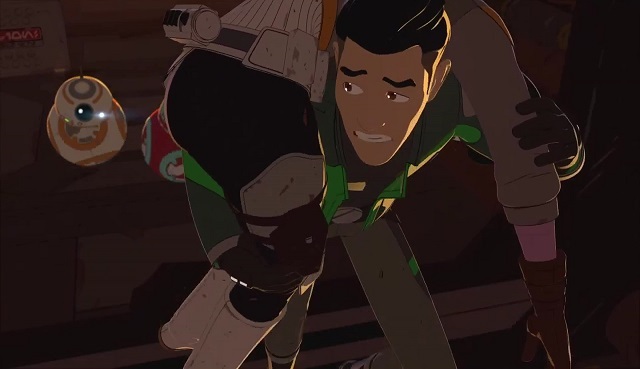 Poe trusts Kaz with secrets, that much is clear, and he has faith in him to accomplish what he’s been asked but has given him little to no assistance or direction to do so, simply taking on faith that Kaz will figure it out before he gets himself killed. It’s a bit ironic that Poe Dameron, who in a few (in-universe) months will be so frustrated and angry with not being let in on an operational plan that he leads a mutiny, has tossed Kaz into his mission almost entirely blind. In the show’s most recent episode, Kaz even raises concerns to Poe about this, that he barely knows what he’s doing, concerns that Poe brushes off. It will be interesting to see how well Poe’s faith will be borne out as the show goes on, and whether Poe’s plan has any more layers to it than just tossing an inexperienced fish-out-of-water in the direction of a frying pan. If we take it as an audience that it was a correct decision by Poe to give Kaz this mission, it gives him almost preternatural powers of perception, the ability to see that no matter what happens, Kaz will pull through. Or perhaps he is just trusting to luck and having faith. But we can also look at it as a stepping stone for Poe’s growth as a leader. This sort of decision is a prelude to his decisions in TLJ, and that is the crucible where his entire outlook on command, and his role in the Resistance, changes. Whatever role Kaz has to play moving forward in the show itself, he’s already playing a role in Poe’s story.